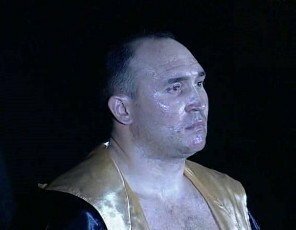 Hamilton New Zealand was the scene of a battle of differing proportions—6’8” Belarussian Alexander Ustinov squared off against Kiwi Samoan 5’9” David Tua who also gave up 50 lbs in weight. Round One: Feeling out round. Ustinov controls the action, with Tua backing up. Round Two: Round is Ustinov’s but Tua is more aggressive and loosening up his left hook. Round Three: Ustinov’s round. He continues to keep his left low but Tua won’t throw a right hand. Tua mostly missing with his left hook, but connects with a few. Round Four: Ustinov keeps jabbing, Tua trying to throw more punches but not connecting flush. Ustinov fighting a good strategic fight. Round Five: Closest round yet. Tua opens with great hook, but Ustinov closes off with two good right hands. Round Six: Slow fight. Tua very inactive and gets caught with a right cross. Ustinov pitching a shutout at this point. Round Seven: Same round. Tua keeps missing with wild hooks. Ustinov peppers him with punches at the end of the round. Tua is staying too far outside to be effective. Round Eight: Groundhog day. Some initial aggression from Tua but nothing that really connects. Ustinov slowing down slightly. Round Nine: Tua acting a bit more desperate, throwing left and right hooks, but even when they connect, they don’t seem to affect Ustinov. Does Tua still have his power? Round Ten: Ustinov picking up the tempo slightly, and sticking out his jab every time Tua moves in. Don’t think Tua has won a round, needs to go for the knockout. Round Eleven: Tua is slightly more active, but ineffective, still throwing single punches. Round Twelve: Ustinov picks up his tempo this round keeping Tua from penetrating. Tua finally throws caution to the wind last 10 seconds with no effect. Don’t think he won a round. Decision: Ustinov by unanimous decision. Is this end of the road for Tua? Robbie Berridge wins by TKO referee stoppage in the 10th round over Daniel MacKinnon. Clearly the most thrilling fight of the undercard, with both fighters cut and down multiple times.